The Entrepreneurship Society and L4 Ventures hosted an event in Downtown Toronto, which brought together some of the best and brightest in Canada’s blockchain industry. The large group of digital currency enthusiasts, developers, and investors were treated to an evening of networking, presentations, and optimism. A consistent theme from all of the presenters was the almost overwhelming rate of growth that many of the companies were experiencing. The demographics of the crowd was very diverse, ranging from seasoned blockchain veterans to those brand new to the digital currencies but eager to learn more. The evening was opened by Ethan Wilding, Head of development at L4 and member of the founding team behind Ethereum. Wilding excitedly spoke about ETHGlobal, an organization that facilitates Ethereum hackathons across the globe. Wilding had just returned from ETHDenver and was excited about the positivity and enthusiasm found at the hackathons. The first Hackathon was ETHWaterloo, which happened in October 2017. That hackathon produced the now infamous CryptoKitties, which was so popular it almost broke the Ethereum network. The success of ETHWaterloo inspired them to create ETHGlobal. L4 is also currently working on state channels for Ethereum, and off-chain scaling solution, as well as the MakerDAO. The MakerDAO has developed a stablecoin, a digital currency pegged to $1 USD. The purpose of a stablecoin is to provide consumers with a less volatile way to transact on the blockchain. MakerDAO sets itself apart from other stablecoins, by also acting as a decentralized lending platform. Borrowers can use Ethereum as collateral and receive a loan from MakerDAO. L4 has created a $45 million dollar stable fund, that is available to support developers working on the Maker platform. Citizen Hex, a Toronto-based start-up, presented their work on an ERC-20 token trading platform. They are trying to apply the principals behind high-frequency trading to ERC-20 Tokens. They are also developing what they claim to be the world’s most secure cold and hot wallets. Aion is a Toronto-based start-up that hopes to unite many existing private and public blockchains into one seamless network. Currently in the beta testing phase, their platform plans to act as a hub that can easily bridge existing blockchains platforms, like Ethereum and Neo. One fascinating development they are working on is decentralized applications (dApps) that can run on multiple blockchains. Currently, dApps are native to the blockchain they were developed on. Aion is working to create dApps that could run on multiple blockchain platforms, a development that would move dApp technology ahead by leaps and bounds. Mohit Sud, Director of Technology at Coinsquare, discussed the company’s past and future. Sud, who was employee number four at Coinsquare, was excited to talk about the companies explosive growth over the past few months. Sud told his story of how he came to get involved in the blockchain industry, as well as the explosive growth they have seen in the past few months. The Blockchain Research Institute presented a little bit about the ways they are studying the impact of blockchain technology on business, government, and society. They have over 70 projects that are researching various blockchain strategies, market opportunities, and implementation challenges. 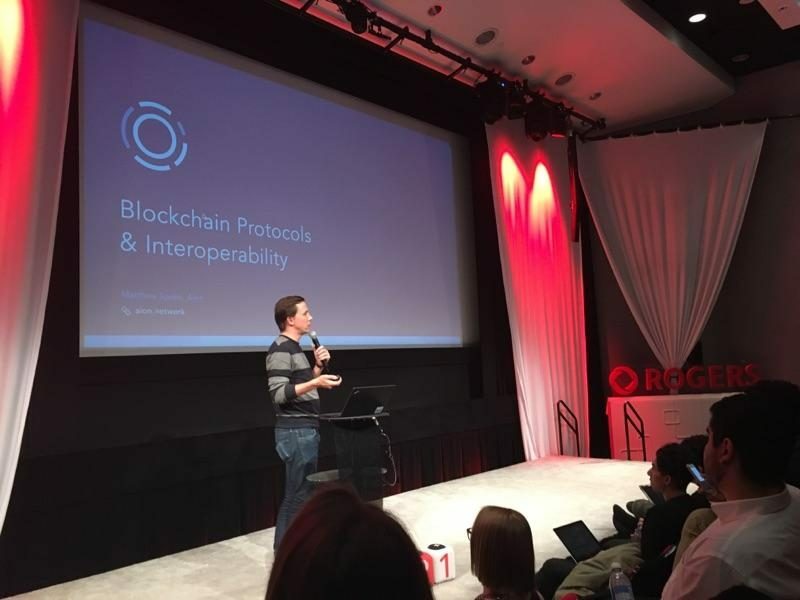 The Blockchain Research Institute has already partnered with a vast array of companies, such as CIBC, Bell, Microsoft, and Interac. Betterplace hopes to have an impact on the world by creating a blockchain platform that simplifies and gamifies social activism. They saw that although there are many people who wish to get engaged in social activism, there is not an easy and effective way for them to do so. They feel many of the platforms for social activism, such as online petitions, fall short and often have little impact. Their hope is that the platform will create a new way for people to unite against causes they are passionate about. The platform also notifies people of similar causes for them to get involved in. Users of the platform will earn rewards for accomplishing tasks related to causes they are concerned about. They believe that gamification of tasks has a profound impact on people’s follow through and engagement. The last presenter of the night was Kleros, a platform for justice on the blockchain. Kleros can be added to a smart contract, for instance, for something like freelance work. If the client is unhappy with the freelance work they can ask Kleros for arbitration. The technology will work for many use cases besides freelance work, such as delivery of goods and copyright infringement. The concept is simple and may prove to be very useful in an increasingly global economy where an institution, like small claims court, provides little effect. The event ended with some time to network and discuss the projects that people are passionate about. The overall feeling in the room was one of optimism and enthusiasm for blockchain technology and the power it has to revolutionize society. One common thread with every presenter was the explosive growth they were experiencing and their need to hire people passionate about the blockchain. They are not just looking for developers but anyone passionate about the industry and eager to learn more.